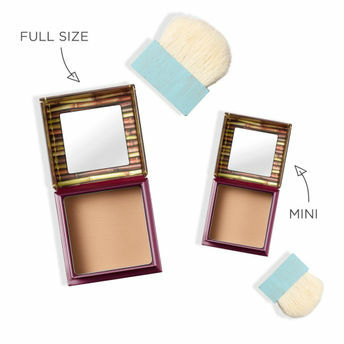 Dust this award-winning bronzing powder over your chin, cheeks and forehead for a healthy, natural looking "tan" year-round. Complete with soft, natural-bristle cheek brush, it's pure matte color...noo sparkle or shine! About the brand: Creating Fake Its & Instant Beauty Solutions since 1976! Benefit Cosmetics started by creating the original rose-tinted stain in the beauty industry and haven't stopped since! From a collection of fast and fabulous brow products to cult-classic bronzers and best-selling mascaras, the brand offers quick fixes for all of your beauty dilemmas.The products and packaging are as unique and distinctive as the gals (and guys) who wear them. Explore the entire range of Bronzer available on Nykaa. Shop more Benefit Cosmetics products here.You can browse through the complete world of Benefit Cosmetics Bronzer .Alternatively, you can also find many more products from the Benefit Cosmetics Hoola Matte Bronzer range.